Why are the Grizzlies games in Philly ALWAYS go down to the last second?! We, and by we I mean the Memphis Grizzlies, won in Double OT 104-99 in Philadelphia Wednesday night November 23, 2016 – and I was there to witness it. Because it was the day before Thanksgiving and I had to drive north on route 95, I left my house at 11:15am for a 7pm tipoff in Philly just under two hours away (doors were at 5pm and seats at 6pm). I listened to my Elvis radio all the way up. Traffic wasn’t too bad. It took me about a half hour longer than usual. I arrived in Philly around 1:40pm. The folks in the parking lot were very nice and happy. I parked at Xfinity Live and hung out at the NBC Sports Arena, which is a bar/restaurant with 14 tvs including two big screens and one really big screen – the biggest I’ve ever seen. Xfinity Live is an indoor bar / restaurant center located on the grounds of the baseball stadium, the football stadium and the basketball and hockey arena. The NBC Sports Arena was the only place open inside. They had a great $5 lunch special that included a huge double cheeseburger with both cheese sauce (like a philly cheesesteak) and cheddar cheese and french fries – for only $5. An amazing deal! Coupled with a large iced tea, I was very happy. Around 3:30 I moved my car across the parking lot next to the arena. Carefully parked near my seat, so I could get out rather quickly after the game. I charged my phone and watched some shows on my kindle until the doors opened at 5pm. At 5:30, we (the VIPs) were escorted to section 102 to watch the shoot around. This is on the 76ers side, but I could still see my Grizzlies. Only Gasol and Conley were out. Marc saw my grizz towel and gave me the nod. At 6pm, we were allowed to go to our seats. I had a 2nd row seat on the floor between the Grizzlies bench and tunnel. As Marc Gasol was coming off the court, he stopped for a photo with me. I finally got my picture with Big Spain! Later as the players were taking the court to warm up, Chandler Parsons finally walked out, or rather limped out, and literally brushed up against me as he limped by. I said, “Hi” and he said, “Hi,” but I didn’t ask for the photo I wanted because Chandler just didn’t look like he was feeling too well. I could have gotten my photo with ZBo, but I got a great shot of us last year in Philly so I didn’t want to be greedy for those who may have never met him. I was able to sit in the front row for most of the first quarter. ZBo saw me from the bench during a time out and gave me a smile and nod and that pat his heart thing he does to signal love. What a guy! Tony Allen finally saw my “All Heart Grit Grind” towel and gave me a great big smile from the bench. Apparently I was on tv (the Grizzlies broadcast anyway) a lot holding my towel high and proud. There were only about 10 of us Grizzlies fans spread throughout the Wells Fargo Center. Biz Markie and M Night Shyamalan were also at the game – kept walking in front of me. The 76ers fans were surprisingly cool. 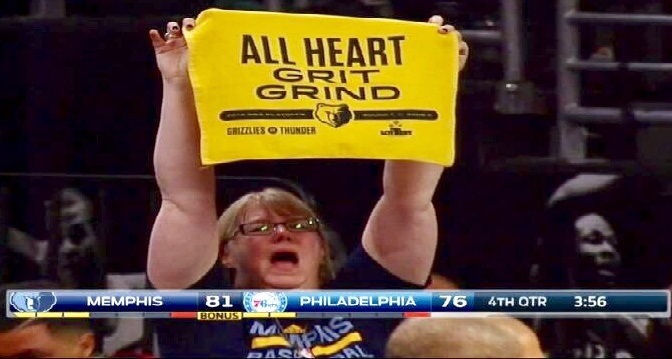 The Grizzlies were losing the entire game by six or more. We were playing terribly and the refs were not helping. We didn’t tie it up until midway through the 4th quarter, then took the lead, then the Sixers tied it up and we went into OT. Then we went into a second OT and finally won 104-99! I waited around to watch all the players go back into the locker room before running out to my car hoping not to get too stuck in the parking lot. I got lost walking in the parking lot – again! I always do this in Philly, and I had purposely parked right outside the door closest to my section – or so I thought. Then I made a wrong turn getting out of the parking lot. I mean I have only been going to concerts and games at that sports complex in Philly for 25 years. I was finally on 95 at 10:45pm and was home by 12:35am throat hurting from screaming at the game and singing Elvis all the way home. Click here for all my photos from Grizzlies in Philly.